On this date in 1891 Lili’uokalani (1838 – 1917), born Lydia Lili’u Loloku Walania Wewehi Kamaka’eha (commonly referred to as Lili’u), became the last monarch and only queen regnant of the Kingdom of Hawai’i. She was also known as Lydia Kamaka’eha Pākī, with the chosen royal name of Lili’uokalani, and her married name was Lydia K. Dominis. 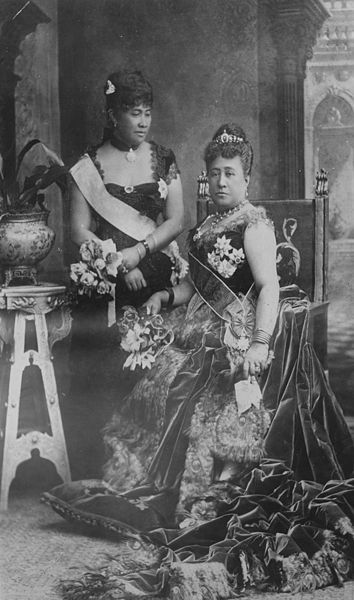 Lili’uokalani inherited the throne from her brother Kalakaua. Lili’u was born on September 2, 1838 to the High Chiefess Analea Keohokalole and High Chief Caesar Kaluaiku Kapa’akea. In accordance with the Hawai?ian tradition of hanai, she was adopted at birth by Abner Pākī and his wife Laura Kania who were higher rank than her natural parents. Hanai is a difficult practice for Westerners to understand because it is based on a system of kinship entirely different from Western norms. Traditionally kin relationships were highly fluid in Hawai’i and children could move between families with ease (even into adulthood). Lili’u noted in her biography that hanai “is not easy to explain… to those alien to our national life, but it seems perfectly natural to us. As intelligible a reason as can be given is that this alliance by adoption cemented the ties of friendship between the chiefs.” Sometimes also, childless couples would be given children for adoption from families with an abundance. Perhaps one way to think about it was that there was a general sense of kinship among all families, so it was not terribly important where any particular child lived. The custom of hanai was strongly condemned by the missionaries. They couldn’t understand the looseness of natural family ties. They could not get beyond their concept of the “immediate family” or nuclear family. There weren’t any anthropologists around at the time to help them out. Lili’u received her education at the Chiefs’ Children’s School (later known as the Royal School), and became fluent in English. She attended the school with her two older brothers James Kaliokalani and David Kalākaua,. On September 16, 1862, Lili’u married John Owen Dominis, who became Governor of O?ahu and Maui. Her marriage to Dominis was an unhappy match. He was unfaithful to her and had many affairs, a fact that family friend and royal physician Georges Phillipe Trousseau tried to hide from her. But in 1882 Dr. Trousseau had to inform her that one of her household retainers was pregnant with her husband’s son. Lili’u’s first reaction was to attempt to claim the child as her own, putting him in line to the throne, to spare her husband the embarrassment. She understood this was illegal and would undermine the integrity of the monarchy, but she wanted to protect her husband. Although Lili’u’s named successor was her niece Princess Ka’iulani (1875–99), Ka’iulani predeceased her. Lili’uokalani had three hānai children: Lydia Ka’onohiponiponiokalani Aholo; Kaiponohea ‘Ae’a, the son of a retainer; and John Aimoku Dominis, her husband’s illegitimate son. In 1874, Lunalilo, who was elected to succeed Kamehameha V to the Hawai’ian throne, died and left no heir to succeed to the throne. In the election that followed, Lili’u’s brother, David Kalakaua, ran against Emma, the widowed Queen of Kamehameha IV. Lili?uokalani sided with her family on the issue and when her brother was declared king, bitterness developed between Emma and the Kalakaua family. Upon accession, Kal?kaua gave royal titles and styles to his surviving siblings, his sisters, Princess Lili?u and Princess Likelike, and his brother William Pitt Leleiohoku, making him Crown Prince and heir to the Hawai’ian throne as Kalakaua had no children of his own. Leleiohoku died in 1877, leaving no one to succeed him. Hawai?i did not follow European monarchies in setting a line of succession; heirs had to be lawfully begotten or chosen and approved by the legislature. Leleiohoku’s hānai mother Princess Ruth Ke’elikalani demanded that she be named heir as successor to her son’s right, but Kalakaua wanted to keep the throne within his own family and chose from his two remaining sisters. At noon on April 10, 1877, the sounds of the cannons were heard announcing Lili’u as the newly designated heir apparent to the throne of Hawai’i. From that point on, she was referred to as “Crown Princess” with the name Lili’uokalani, given to her by her brother, who thought her birth name was not regal enough for her future role as queen of Hawai’i. One of her first acts as Crown Princess was to tour the island of O’ahu with her husband, sister, and brother-in-law. In April 1887, Kalakaua sent a delegation to attend the Golden Jubilee of Queen Victoria in London. While on the trip, she learned of the Bayonet Constitution that Kalakaua had been forced, under the threat of death, to sign. She was so upset that she canceled a tour of the rest of Europe and returned to Hawai’i at once. The Bayonet Constitution was a constitutional monarchy, somewhat modeled on Western examples, to replace the traditional absolute monarchy by US and European business interests who wanted greater influence. “Bayonet” refers to the fact that Kalakaua was forced to sign at bayonet point. Lili’uokalani inherited the throne from her brother Kalakaua on January 29, 1891. Shortly after ascending the throne she received petitions from her people through the two major political parties of the time, Hui Kala’aina and the National Reform Party. 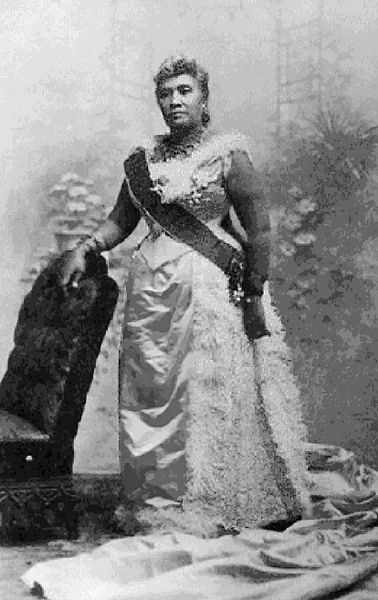 Believing she had the support of her cabinet and that to ignore such a general request from her people would be against the popular will, she moved to abrogate the existing 1887 Bayonet Constitution, by drafting a new constitution that would restore the veto power to the monarchy and voting rights to economically disenfranchised native Hawai’ians and Asians. The effort to draft a new constitution never came to fruition, because of the U.S. invasion, occupation and overthrow of the Hawai’i monarchy and government. Threatened by the queen’s proposed new constitution, U.S. and European businessmen and residents organized to depose Lili’uokalani, asserting that the queen had “virtually abdicated” by refusing to support the 1887 Constitution. Business interests within the kingdom were also upset about what they viewed as “poor governance” of the kingdom, and because of the U.S. removal of foreign tariffs on the sugar trade due to the McKinley Tariff. The tariff eliminated the favored status of Hawai’i on sugar guaranteed by the Reciprocity Treaty of 1875. North Americans and Europeans actively sought annexation to the United States so that their businesses might enjoy the same sugar bounties as domestic producers. In addition to these concerns, Lili’uokalani believed that American businessmen, like Charles R. Bishop, expressed an anxiety concerning a female head of state. On January 14, 1893, a group composed of North Americans and Europeans formed a Committee of Safety seeking to overthrow the Hawai’ian Kingdom, depose the Queen, and seek annexation to the United States. As the coup d’état was unfolding on January 17 the Committee of Safety expressed concern for the safety and property of American citizens. In response, United States Government Minister John L. Stevens summoned a company of US Marines from the USS Boston and two companies of U.S. Navy sailors to take up positions at the U.S. Legation, Consulate, and Arion Hall. On the afternoon of January 16, 1893, 162 sailors and U.S. Marines aboard the USS Boston in Honolulu Harbor came ashore under orders of neutrality. Historian William Russ has noted that the presence of these troops, ostensibly to enforce neutrality and prevent violence, effectively made it impossible for the monarchy to protect itself. I, Lili’uokalani, by the Grace of God and under the constitution of the Hawai?ian Kingdom, Queen, do hereby solemnly protest against any and all acts done against myself and the constitutional government of the Hawai?ian Kingdom by certain persons claiming to have established a Provisional Government of and for this Kingdom. That I yield to the superior force of the United States of America, whose Minister Plenipotentiary, His Excellency John L Stevens, has caused United States troops to be landed at Honolulu and declared that he would support the said Provisional Government. Now, to avoid any collision of armed forces and perhaps loss of life, I do, under this protest, and impelled by said forces, yield my authority until such time as the Government of the United States shall, upon the facts being presented to it, undo the action of its representative and reinstate me in the authority which I claim as the constitutional sovereign of the Hawai?ian Islands. A provisional government, composed of European and U.S. businessmen, was then instituted until annexation with the United States could be achieved. On February 1, 1893, the US Minister (ambassador) to Hawai’i proclaimed Hawai?i a protectorate of the United States. The administration of Grover Cleveland commissioned the Blount Report, and based on its findings, concluded that the overthrow of Lili’uokalani was illegal, and that U.S. Minister Stevens and American military troops had acted inappropriately in support of those who carried out the overthrow. On November 16, 1893, Cleveland proposed to return the throne back to her if she granted amnesty to everyone responsible. She initially refused, and it was controversially reported that she said she would have them beheaded — she denied that accusation, but admitted that she intended them to suffer the punishment of banishment. With this development, then-President Grover Cleveland sent the issue to the United States Congress. She later changed her position on the issue of punishment for the conspirators, and on December 18, 1893 U.S. Minister Willis demanded her reinstatement by the Provisional Government. The Provisional Government refused. Congress responded to Cleveland’s referral with a U.S. Senate investigation that resulted in the Morgan Report on February 26, 1894. The Morgan Report found all parties (including Minister Stevens), with the exception of the queen, “not guilty” from any responsibility for the overthrow. The accuracy and impartiality of both the Blount and Morgan reports have been questioned by partisans on both sides of the historical debate over the events of 1893. On July 4, 1894, the Republic of Hawai’i was proclaimed and Sanford B. Dole, one of the first people who originally called on the institution of the monarchy to be abolished, became President. The Republic of Hawai’i was recognized by the United States government as a protectorate, although Walter Q. Gresham, Cleveland’s Secretary of State, remained antagonistic towards the new government. Lili’uokalani was arrested on January 16, 1895, several days after the failed 1895 Counter-Revolution in Hawai?i led by Robert William Wilcox, when firearms were found at the base of Diamond Head Crater. She denied any knowledge at her trial, defended by former attorney general Paul Neumann. She was sentenced to five years of hard labor in prison by a military tribunal and fined $5,000, but the sentence was commuted to imprisonment in an upstairs bedroom of ‘Iolani Palace, where she composed songs including The Queen’s Prayer (Ke Aloha o Ka Haku) and began work on her memoirs. 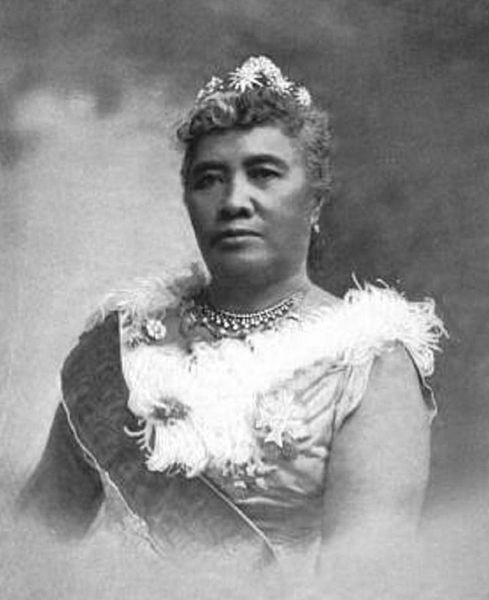 During her imprisonment, she abdicated her throne in return for the release (and commutation of the death sentences) of her jailed supporters, including Minister Joseph Nawahi, Prince Kawananakoa, Robert Wilcox, and Prince Jonah Kuhio. Following her release, she was placed under house arrest for a year and in 1896, the Republic of Hawai’i gave her a full pardon and restored her civil rights. She then made several trips to the United States to protest against the annexation by the United States and attended the inauguration of US President McKinley with a Republic of Hawai?i passport personally issued to “Lili’uokalani of Hawai’i” by President Dole. In 1898, Hawai’i became an incorporated territory of the United States during the Spanish American War and took control of the 1,200,000 acres (4,900 km²) of land that formerly was held in trust by the monarchy and known as “Crown Land.” This later would become the source of the “Ceded Lands” issue in Hawai’i. In 1900, the US Congress passed the Hawai’i Organic Act establishing a government for the Territory of Hawai’i. From 1905 to 1907, Lili’uokalani entered claims against the U.S. totaling $450,000 for property and other losses, claiming personal ownership of the crown lands, but was unsuccessful. The territorial legislature of Hawai’i finally voted her an annual pension of $4,000 and permitted her to receive the income from a sugar plantation of 6,000 acres (24 km²), which was the private property of her late brother before his election as king. 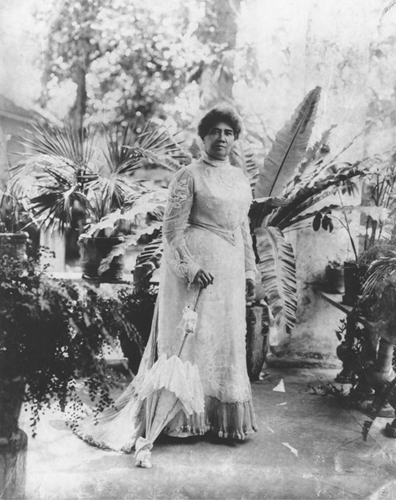 In 1910, Lili’uokalani brought an unsuccessful lawsuit against the United States seeking compensation under the Fifth Amendment for the loss of the Hawai’ian crown land. Lili’uokalani was also remembered for her support of Buddhist and Shinto priests in Hawai’i and became one of the first Native Hawai’i ans to attend a Vesak Day (Buddha’s Birthday) celebration of May 19, 1901 at the Honwangji mission. Her attendance in the celebration had helped Buddhism and Shintoism gain acceptance into Hawai’i’s society and prevented the possible banning of those two religions by the Territorial government. Her presence was also widely reported in Chinese and Japanese newspapers throughout the world and earned her the respect of many Japanese people both in Hawai’i and in Japan itself. She lived in Washington Place until her death in 1917 due to complications from a stroke. She was 79. She received a state funeral due to her status as a former head of state. Upon her death, Lili?uokalani dictated in her will that all of her possessions and properties be sold and the money raised would go to the Queen Lili’uokalani Children’s Trust to help orphaned and indigent children. The Queen Lili’uokalani Trust Fund still exists today. To compose was as natural to me as to breathe; and this gift of nature, never having been suffered to fall into disuse, remains a source of the greatest consolation to this day. […] Hours of which it is not yet in place to speak, which I might have found long and lonely, passed quickly and cheerfully by, occupied and soothed by the expression of my thoughts in music. Lili’uokalani helped preserve key elements of Hawai’i’s traditional poetics while mixing in Western harmonies brought by the missionaries. A compilation of her works, titled The Queen’s Songbook, was published in 1999 by the Lili’uokalani Trust. Lili’uokalani was a very peaceful woman, and believed in a peaceful resistance. She used her musical compositions as a way to express her feelings for her people, her country, and what was happening in the political realm in Hawai’i. One example of the way her music reflected her political views is her translation of the Kumulipo, the Hawai’ian creation chant. While under house arrest, Lili’uokalani feared she would never leave the palace alive, so she translated the Kumulipo in hopes that the history and culture of her people would never be lost. Another of her compositions was Aloha Oe, a song she had written previously and transcribed during her confinement. “Aloha Oe” or “Farewell to Thee,” became a very popular song. Originally written as a lovers’ good-bye, the song came to be regarded as a symbol of, and lament for, the loss of her country. The Cuisine of Hawai’i is a fusion of many foods brought by immigrants to the Hawai?ian Islands, particularly of Chinese, Filipino, Japanese, Korean, Polynesian and Portuguese origins as well as from the U.S., including plant and animal food sources imported from around the world for agricultural use in Hawai’i. The great staple is poi, mashed taro root. The Hormel company’s canned meat product Spam has been highly popular in Hawai?i for decades. Hawai’ians are the second largest consumers of Spam in the world, right behind Guam. Originally brought to Hawai’i by American servicemen in their rations, Spam became an important source of protein for locals after fishing around the islands was prohibited during World War II. In 2005, Hawai’ians consumed more than five million cans of Spam. Spam is used in local dishes in a variety of ways, most commonly fried and served with rice. For breakfast, fried eggs are often served with spam. Spam can also be wrapped in ti and roasted, skewered and deep fried, or stir-fried with cabbage. It is added to saimin or fried rice, mashed with tofu, or served with cold s?men or baked macaroni and cheese. It is also used in chutney for pupus, in sandwiches with mayonnaise, or baked with guava jelly. 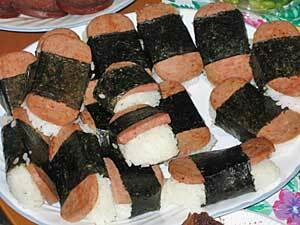 Spam musubi, a slice of fried Spam upon a bed of rice wrapped with a strip of nori, is a popular snack in Hawai?i which found its way on to island sushi menus in the 1980s. 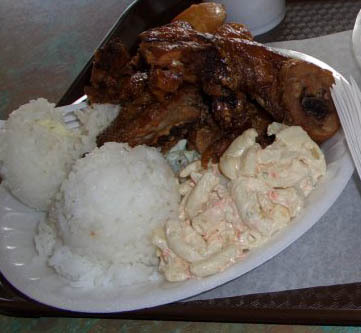 Many local restaurants serve the immensely popular “plate lunch” (originally a cheap and quick worker’s lunch) featuring, two scoops of rice, some version of macaroni salad (often just macaroni and thin mayonnaise), and a variety of different toppings ranging from Loco Moco (a hamburger patty and 2 fried eggs), Japanese style tonkatsu, or the taditional lu’au favorite, kalua pig. I gave a recipe for kalua pig here, http://www.bookofdaystales.com/kamehameha-day-Hawai?i/. Here is a common recipe for Hawai?ian macaroni salad. Hawai?ian macaroni salad is usually made with pasta that is very soft but if you prefer you can cook it al dente as I do. Also note that the onion is grated and not chopped. Cook the macaroni in a large pot of boiling salted water to the desired softness. Drain and return to the pot. Add the cider vinegar and toss until absorbed. Let cool for 10 minutes. Whisk together 1 ½ cups of the milk, 1 cup of the mayonnaise, the brown sugar, ½ tsp of salt and 2 tsps of freshly ground pepper. Add the dressing to the macaroni, stir it in completely, and let the pasta cool to room temperature. Add the remaining ½ cup milk and 1 cup of mayonnaise, along with the onion, carrot, and celery. Stir to combine, and season to taste with salt and pepper. Chill for at least one hour before serving.